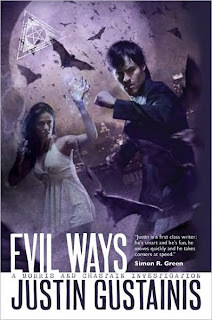 Evil Ways, the second book in the Quincy Morris urban fantasy series is due to hit the bookshelves shortly after Christmas. Here's a description of the book from the Solaris site. BookSpot Central has a new extensive excerpt posted here. I'll definitely be reviewing this one. Supernatural investigator Quincey Morris and his partner Libby Chastain, investigate a series of murders where white witches are being hunted and killed - and Libby may be next on the list. From Iraq to America, a trail of clues is pointing to eccentric billionaire, Walter Grobius, a man fascinated with a devastating evil that can be traced back to biblical times. What's more, it seems he may well be involved in a sick scheme for white supremacy across the USA, and Morris and Chastain find themselves in their most epic case as they look to prevent the apocalypse from being released.